It's almost Thanksgiving. You probably need a cocktail or three. For some bright new ideas, we called up Laena McCarthy, the genius behind Brooklyn's Anarchy in a Jar, who loves to stir preserves into booze—a smart way to add complex, fruity flavor with a minimum of effort. You can find Anarchy in a Jar's preserves at stores nationwide and at Mouth.com. 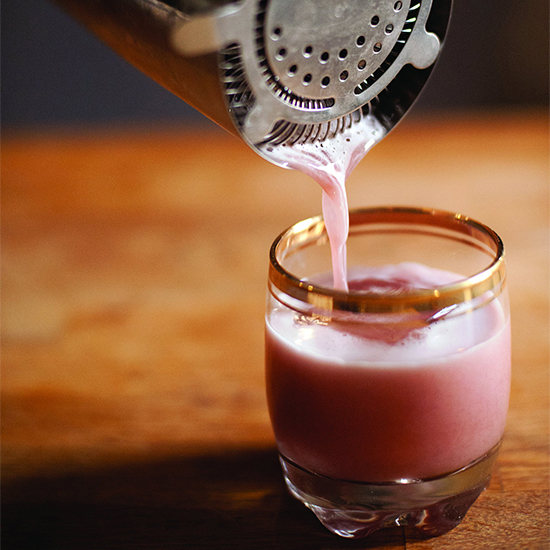 Here, McCarthy's five favorite jam cocktails. McCarthy recommends using a lighter smoked salt in this recipe, one that uses alder or oak wood rather than a stronger wood like hickory. 1. Lightly salt the rim of the glass: Pour smoked salt into a saucer. Moisten the top rim of a highball glass with water and then press it into the saucer to coat the rim with salt. Fill the glass with ice cubes. 2. In an ice-filled shaker, combine the gin, elderflower liqueur, marmalade and lemon juice. Shake for about 15 seconds. Strain into the prepared glass and top with club soda. This is McCarthy's ode to Thanksgiving—pour it all day long. In a pinch, substitute cranberry sauce for the jam. 1. In a lowball glass, stir together the jam, bitters and orange zest. Use a muddler to gently press the zest to release the citrus oils. Stir in the whiskey; add ice cubes and stir again. 1. In an ice-filled glass, stir together the whiskey, white wine, pear jam, Calvados, Green Chartreuse, and bitters. Strain into a chilled coupe glass. Garnish with the orange twist. Here's a brunch cocktail that McCarthy says is great with pancakes. (And...that's a recipe for a nap.) You can use regular lemons instead of Meyer lemons if necessary—the cocktail will be a bit more tart. 1. In an ice-filled glass, stir together the bourbon, maple syrup, lemon juice, bitters, and blueberry preserves. Strain into a chilled coupe glass. Garnish with the Meyer lemon twist. "I got hooked on micheladas when visiting my friends at their restaurant Erloom in Querétaro, Mexico," says McCarthy. Her twist on the classic beer cocktail is spiked with mustard. 1. Prepare 4 glasses: Pour some celery salt into a saucer. Rub the glasses' rims with a lime wedge, to moisten, then press into the salt in the saucer, to coat. 2. In a measuring cup, combine the tomato juice, lime juice, 1/4 teaspoon celery salt, Worcestershire, mustard and hot sauce and mix well. Adjust seasoning to taste. 3. Add a handful of ice cubes to each of the prepared glasses, then divide the juice mixture among them. Top up the glasses with half a bottle of beer each, then garnish with a lime wedge and a celery stick.